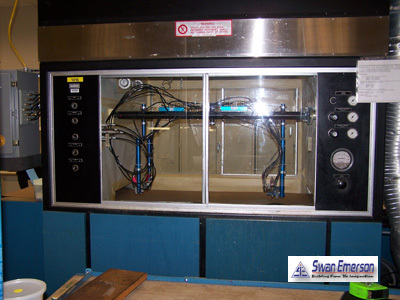 The IT Spray System was an existing conformal coating machine used in the aeronautical industry. It was being used for multiple coatings which involved extensive changeover time from material to material. The upgrade involved multiple pressure pots, pneumatically actuated valves, a touch screen operator interface and a PLC to perform the changeover to a different material automatically. This greatly reduced changeover time and operator exposure to hazardous materials and solvents.